Please read below in this post about the Maya Sherpa Project’s two-for-one match for donations for the Sherpa families affected by the tragedy on Everest. Donate HERE. Willie on Kala Patthar. Click on the image to view the 2011 documentary video. heard and felt the rumble, even though we were on a different mountain top, 18,400 feet up, across a valley, probably 20 KM from Base Camp. I happened to get a video of it from that distance. It is at 00:43:00 of my film I made of that trek. The video is on YouTube. That avalanche is also visible in the photo to the left and on the front cover of my book below. If your computer is connected to a good sound system you can hear and feel the power of the avalanche. 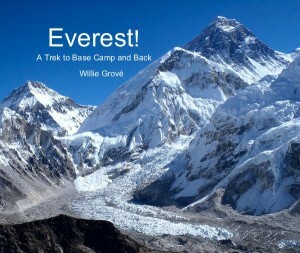 Many of my friends know that I have been supporting the Maya Sherpa Project (MSP) with the proceeds of my book, Everest! A Trek to Base Camp and Back. Pattie Moon, founder and Executive Director of the Maya Sherpa Project told me that this endeavor has sponsored two girls to go to school, and is helping with other projects in Meru, a village in the Solu Kumbu where MSG has been working for several years. I am so grateful for the support my clients and friends have provided with their donations and purchases of my book, as well as the proceeds of the book sale online. The book retails online for $94.99, with a $10 profit going to MSP. I have a supply of books which I printed/purchased at a discount, and have given away hundreds of books in exchange for a $100 or larger donation to MSG, with my cost of the book being my donation. They carry the heaviest loads and pay the highest prices on the world’s tallest mountain. On April 18, 2014, an avalanche buried an entire crew of Sherpa guides who were working at almost 20,000 feet, setting ladders and ropes for the client climbers to follow later. This accident was unprecedented, with 16 deaths on one day, as well as injured others. What you may also not know, is that the Sherpas do this difficult and dangerous work for very little money. But it is one of the few ways they can earn enough to support their families, and give their children an education. For those who died and were injured, there will be an insurance distribution by the trekking companies and government; but it is inadequate compensation for the loss. It soon becomes obvious to us all that, without the father/son/brother who died on the mountain, these families will have little or no income to live on, let alone provide an education for their children. The Maya Sherpa Project has – at its very core – the charter to help provide educational and health resources for the Sherpa communities in the Himalayas. In particular, we strive to bring support to those very remote villages which do not receive tourist dollars or foundation gifts. We now want to extend this assistance to the Sherpa families affected by the recent tragedy; we will set up scholarships for the children who have lost a father or brother or another wage earner in their family. The Maya Sherpa Project (MSP) has now set up a special fund – THE MT. EVEREST SHERPA SCHOLARSHIP FUND – which will be distributed for the education of the children of those who lost their lives or their ability to work again. We will focus on the families that come from the remote areas that have few other options for employment. We would be honored to have you join us in this effort, as the MSP will meet all contributions with a matching donation at twice the amount given. If you contribute $25, we will add another $50 to your amount! Any contribution you give will be of valuable assistance, as our entire project expenses go directly to the villagers. One of our board members, Dawa Sherpa, leaves for Nepal next week. While there, he will assess the insurance distributions that are to be made, and look for opportunities to support families who are especially in need – for the continuation of their children’s education.